Vitamin D deficiency in pregnant women could preprogram babies to grow into obese children and adults, according to a Keck School of Medicine of USC-led study. Researchers found that 6-year-olds born to mothers with very low vitamin D levels during their first trimester had bigger waists - about half an inch plumper on average - than peers whose mothers had enough vitamin D in early pregnancy. These kids also had 2 percent more body fat. "These increases may not seem like much, but we're not talking about older adults who have about 30 percent body fat," said Vaia Lida Chatzi, senior author of the study and an associate professor of preventive medicine at the Keck School of Medicine. "Even a half-inch increase in waist circumference is a big deal, especially if you project this fat surplus across their life span." The study, published in the journal Pediatric Obesity in January, examined the data of 532 mother-child pairs in Greece. Maternal vitamin D concentrations were measured during the first prenatal visit. The child's health and weight were measured at 4 and 6 years. Some 75 percent of U.S. teenagers and adults have too little vitamin D in their system, according to a 2009 study. Deficiency in this "sunshine vitamin" has been linked to increased risk of heart disease, cancer, multiple sclerosis and Type 1 diabetes. A newborn's vitamin D status mostly depends on mom. So infants are at risk of vitamin D deficiency if their mothers are vitamin D deficient or are close to it. About 95 percent of the vitamin D produced in your body comes from sunshine, Chatzi said. The remaining 5 percent is derived from eggs, fatty fish, fish liver oil and fortified foods such as milk, cheese, yogurt and cereal. "We're not sure why there is vitamin D deficiency even in places with abundant sunshine, but maybe people are spending too much time indoors with their screens or typing away in their office cubicles," Chatzi said. "Or maybe they're using excessive amounts of sunscreen, which inhibits vitamin D production." The prevalence of vitamin D deficiency among pregnant women has increased in the last two decades, Chatzi said. About 66 percent of the pregnant women in the study had insufficient vitamin D in the first trimester, a critical period for organ development. Previous studies by others provide hints to why low vitamin D levels is a problem. Animal studies have shown that vitamin D suppresses pre-fat cells (adipocytes) from maturing into fat cells. Test tube studies of human fat cells also showed that vitamin D may hinder pre-fat cells from turning into fat cells. "It's possible that children of mothers with low vitamin D have higher body mass index and body fat because vitamin D appears to disrupt the formation of fat cells," Chatzi said. "Optimal vitamin D levels in pregnancy could protect against childhood obesity, but more research is needed to confirm our findings. 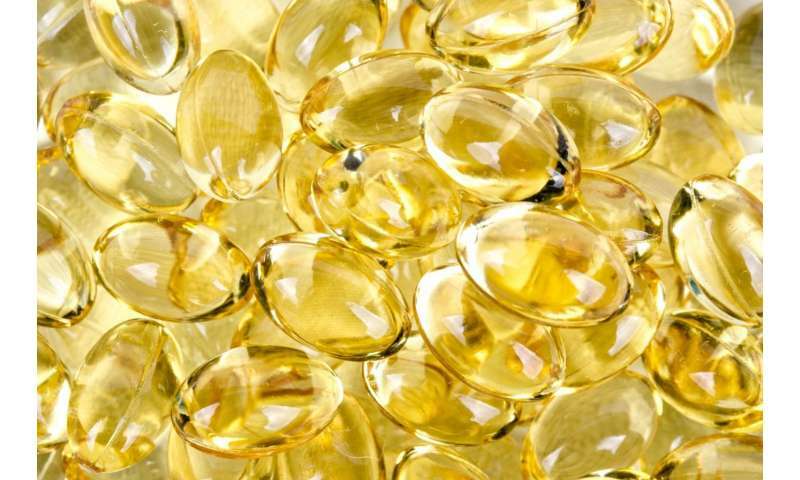 Vitamin D supplements in early pregnancy is an easy fix to protect future generations." None of the Greek women in the study took prenatal vitamin D supplements. Most American doctors recommend that women start taking prenatal vitamins before trying to conceive to make sure folic acid, iron, calcium and other nutritional levels are adequate to prevent birth defects. Most prenatal vitamins contain 400 international units (IU) (10 micrograms) of vitamin D per tablet. The federal government has not set a recommended daily intake of vitamin D, though many agree the dietary intake of the vitamin should increase with age. The Institute of Medicine of The National Academies recommends that females 1 to 70 years old consume 600 IU (15 micrograms) of vitamin D daily, regardless of their pregnancy status. The group sets tolerable maximum levels at 4,000 IU (100 micrograms) for pregnant and non-pregnant women who are 19 and older. Lower levels are advised based on age. Too much vitamin D can cause damage to the heart, blood vessels and kidneys, according to the National Institutes of Health. "It's too early for researchers to recommend increasing the standard amount of vitamin D contained in prenatal vitamins," Chatzi said. "First we need to conduct randomized clinical trials."